14:1.9 The billion worlds of Havona are arranged in seven concentric circuits immediately surrounding the three circuits of Paradise satellites. There are upwards of thirty- five million worlds in the innermost Havona circuit and over two hundred and forty-five million in the outermost, with proportionate numbers intervening. Each circuit differs, but all are perfectly balanced and exquisitely organized, and each is pervaded by a specialized representation of the Infinite Spirit, one of the Seven Spirits of the Circuits. In addition to other functions this impersonal Spirit co-ordinates the conduct of celestial affairs throughout each circuit. 14:1.10 The Havona planetary circuits are not superimposed; their worlds follow each other in an orderly linear procession. The central universe whirls around the stationary Isle of Paradise in one vast plane, consisting of ten concentric stabilized units—the three circuits of Paradise spheres and the seven circuits of Havona worlds. Physically regarded, the Havona and the Paradise circuits are all one and the same system; their separation is in recognition of functional and administrative segregation. 14:1.11 Time is not reckoned on Paradise; the sequence of successive events is inherent in the concept of those who are indigenous to the central Isle. But time is germane to the Havona circuits and to numerous beings of both celestial and terrestrial origin sojourning thereon. Each Havona world has its own local time, determined by its circuit. All worlds in a given circuit have the same length of year since they uniformly swing around Paradise, and the length of these planetary years decreases from the outermost to the innermost circuit. 14:1.12 Besides Havona-circuit time, there is the Paradise-Havona standard day and other time designations which are determined on, and are sent out from, the seven Paradise satellites of the Infinite Spirit. The Paradise-Havona standard day is based on the length of time required for the planetary abodes of the first or inner Havona circuit to complete one revolution around the Isle of Paradise; and though their velocity is enormous, owing to their situation between the dark gravity bodies and gigantic Paradise, it requires almost one thousand years for these spheres to complete their circuit. You have unwittingly read the truth when your eyes rested on the statement "A day is as a thousand years with God, as but a watch in the night." One Paradise-Havona day is just seven minutes, three and one-eighth seconds less than one thousand years of the present Urantia leap-year calendar. 14:1.13 This Paradise-Havona day is the standard time measurement for the seven superuniverses, although each maintains its own internal time standards. 14:1.14 On the outskirts of this vast central universe, far out beyond the seventh belt of Havona worlds, there swirl an unbelievable number of enormous dark gravity bodies. These multitudinous dark masses are quite unlike other space bodies in many particulars; even in form they are very different. These dark gravity bodies neither reflect nor absorb light; they are nonreactive to physical-energy light, and they so completely encircle and enshroud Havona as to hide it from the view of even near-by inhabited universes of time and space. 14:1.15 The great belt of dark gravity bodies is divided into two equal elliptical circuits by a unique space intrusion. The inner belt revolves counterclockwise; the outer revolves clockwise. These alternate directions of motion, coupled with the extraordinary mass of the dark bodies, so effectively equalize the lines of Havona gravity as to render the central universe a physically balanced and perfectly stabilized creation. 14:1.16 The inner procession of dark gravity bodies is tubular in arrangement, consisting of three circular groupings. A cross section of this circuit would exhibit three concentric circles of about equal density. The outer circuit of dark gravity bodies is arranged perpendicularly, being ten thousand times higher than the inner circuit. The up-and-down diameter of the outer circuit is fifty thousand times that of the transverse diameter. 14:1.18 In our opinion, nothing like the dark gravity bodies of the central universe will characterize the future evolution of the outer space levels; we regard these alternate processions of stupendous gravity-balancing bodies as unique in the master universe. 14:3.1 Concerning the government of the central universe, there is none. Havona is so exquisitely perfect that no intellectual system of government is required. There are no regularly constituted courts, neither are there legislative assemblies; Havona requires only administrative direction. Here may be observed the height of the ideals of true self- government. 14:4.9 Decay and death are not a part of the cycle of life on the Havona worlds. In the central universe the lower living things undergo the transmutation of materialization. They do change form and manifestation, but they do not resolve by process of decay and cellular death. 14:4.11 The natives of Havona live on the billion spheres of the central universe in the same sense that other orders of permanent citizenship dwell on their respective spheres of nativity. As the material order of sonship carries on the material, intellectual, and spiritual economy of a billion local systems in a superuniverse, so, in a larger sense, do the Havona natives live and function on the billion worlds of the central universe. You might possibly regard these Havoners as material creatures in the sense that the word "material" could be expanded to describe the physical realities of the divine universe. 14:4.12 There is a life that is native to Havona and possesses significance in and of itself. Havoners minister in many ways to Paradise descenders and to superuniverse ascenders, but they also live lives that are unique in the central universe and have relative meaning quite apart from either Paradise or the superuniverses. 14:4.13 As the worship of the faith sons of the evolutionary worlds ministers to the satisfaction of the Universal Father's love, so the exalted adoration of the Havona creatures satiates the perfect ideals of divine beauty and truth. As mortal man strives to do the will of God, these beings of the central universe live to gratify the ideals of the Paradise Trinity. In their very nature they are the will of God. Man rejoices in the goodness of God, Havoners exult in the divine beauty, while you both enjoy the ministry of the liberty of living truth. 14:4.18 In addition to the Havona natives, the inhabitants of the central universe embrace numerous classes of pattern beings for various universe groups—advisers, directors, and teachers of their kind and to their kind throughout creation. All beings in all universes are fashioned along the lines of some one order of pattern creature living on some one of the billion worlds of Havona. Even the mortals of time have their goal and ideals of creature existence on the outer circuits of these pattern spheres on high. 14:4.19 Then there are those beings who have attained the Universal Father, and who are entitled to go and come, who are assigned here and there in the universes on missions of special service. And on every Havona world will be found the attainment candidates, those who have physically attained the central universe, but who have not yet achieved that spiritual development which will enable them to claim Paradise residence. 14:4.20 The Infinite Spirit is represented on the Havona worlds by a host of personalities, beings of grace and glory, who administer the details of the intricate intellectual and spiritual affairs of the central universe. On these worlds of divine perfection they perform the work indigenous to the normal conduct of this vast creation and, in addition, carry on the manifold tasks of teaching, training, and ministering to the enormous numbers of ascendant creatures who have climbed to glory from the dark worlds of space. 14:4.21 There are numerous groups of beings native to the Paradise-Havona system that are in no way directly associated with the ascension scheme of creature perfection attainment; therefore are they omitted from the personality classifications presented to the mortal races. Only the major groups of superhuman beings and those orders directly connected with your survival experience are herein presented. 14:4.22 Havona teems with the life of all phases of intelligent beings, who there seek to advance from lower to higher circuits in their efforts to attain higher levels of divinity realization and enlarged appreciation of supreme meanings, ultimate values, and absolute reality. 14:5.8 Monotony is indicative of immaturity of the creative imagination and inactivity of intellectual co- ordination with the spiritual endowment. By the time an ascendant mortal begins the exploration of these heavenly worlds, he has already attained emotional, intellectual, and social, if not spiritual, maturity. 14:6.5 Many superfinite activities take place in the Havona of the present universe age, involving untold diversities of absonite and other phases of mind and spirit functions. 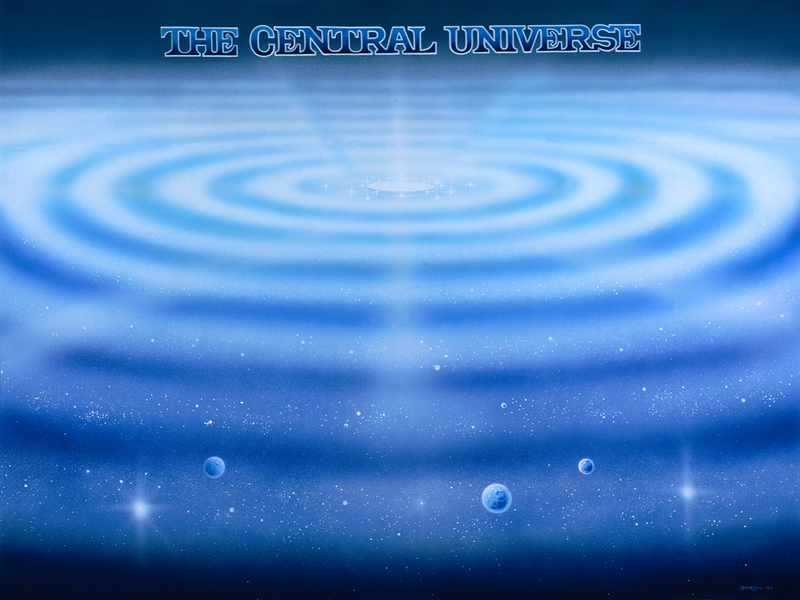 It is possible that the central universe serves many purposes which are not revealed to me, as it functions in numerous ways beyond the comprehension of the created mind. Nevertheless, I will endeavor to depict how this perfect creation ministers to the needs and contributes to the satisfactions of seven orders of universe intelligence. 14:6.6 1. 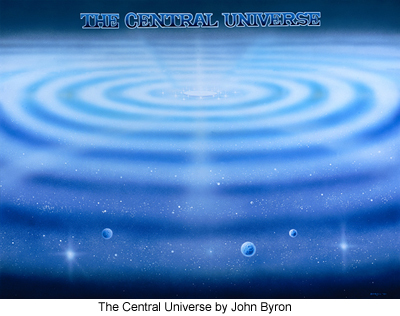 The Universal Father—the First Source and Center. God the Father derives supreme parental satisfaction from the perfection of the central creation. He enjoys the experience of love satiety on near-equality levels. The perfect Creator is divinely pleased with the adoration of the perfect creature. 14:6.7 Havona affords the Father supreme achievement gratification. The perfection realization in Havona compensates for the time-space delay of the eternal urge of infinite expansion. 14:6.8 The Father enjoys the Havona reciprocation of the divine beauty. It satisfies the divine mind to afford a perfect pattern of exquisite harmony for all evolving universes. 14:6.9 Our Father beholds the central universe with perfect pleasure because it is a worthy revelation of spirit reality to all personalities of the universe of universes. 14:6.10 The God of universes has favorable regard for Havona and Paradise as the eternal power nucleus for all subsequent universe expansion in time and space. 14:6.11 The eternal Father views with never-ending satisfaction the Havona creation as the worthy and alluring goal for the ascension candidates of time, his mortal grandchildren of space achieving their Creator-Father's eternal home. 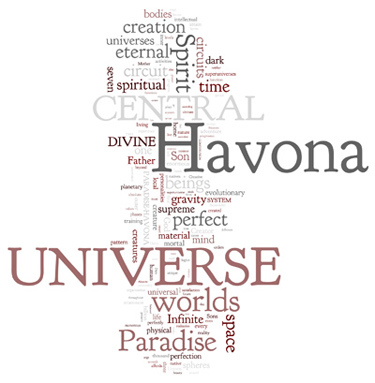 And God takes pleasure in the Paradise-Havona universe as the eternal home of Deity and the divine family. 14:6.12 2. The Eternal Son—the Second Source and Center. To the Eternal Son the superb central creation affords eternal proof of the partnership effectiveness of the divine family—Father, Son, and Spirit. It is the spiritual and material basis for absolute confidence in the Universal Father. 14:6.13 Havona affords the Eternal Son an almost unlimited base for the ever-expanding realization of spirit power. The central universe afforded the Eternal Son the arena wherein he could safely and securely demonstrate the spirit and technique of the bestowal ministry for the instruction of his associate Paradise Sons. 14:6.14 Havona is the reality foundation for the Eternal Son's spirit-gravity control of the universe of universes. This universe affords the Son the gratification of parental craving, spiritual reproduction. 14:6.15 The Havona worlds and their perfect inhabitants are the first and the eternally final demonstration that the Son is the Word of the Father. Thereby is the consciousness of the Son as an infinite complement of the Father perfectly gratified. 14:6.16 And this universe affords the opportunity for the realization of reciprocation of equality fraternity between the Universal Father and the Eternal Son, and this constitutes the everlasting proof of the infinite personality of each. 14:6.17 3. The Infinite Spirit—the Third Source and Center. The Havona universe affords the Infinite Spirit proof of being the Conjoint Actor, the infinite representative of the unified Father-Son. In Havona the Infinite Spirit derives the combined satisfaction of functioning as a creative activity while enjoying the satisfaction of absolute coexistence with this divine achievement. 14:6.18 In Havona the Infinite Spirit found an arena wherein he could demonstrate the ability and willingness to serve as a potential mercy minister. In this perfect creation the Spirit rehearsed for the adventure of ministry in the evolutio universes. 14:6.19 This perfect creation afforded the Infinite Spirit opportunity to participate in universe administration with both divine parents—to administer a universe as associate-Creator offspring, thereby preparing for the joint administration of the local universes as the Creative Spirit associates of the Creator Sons. 14:6.20 The Havona worlds are the mind laboratory of the creators of the cosmic mind and the ministers to every creature mind in existence. Mind is different on each Havona world and serves as the pattern for all spiritual and material creature intellects. 14:6.21 These perfect worlds are the mind graduate schools for all beings destined for Paradise society. They afforded the Spirit abundant opportunity to test out the technique of mind ministry on safe and advisory personalities. 14:6.22 Havona is a compensation to the Infinite Spirit for his widespread and unselfish work in the universes of space. Havona is the perfect home and retreat for the untiring Mind Minister of time and space. 14:6.23 4. The Supreme Being—the evolutionary unification of experiential Deity. The Havona creation is the eternal and perfect proof of the spiritual reality of the Supreme Being. This perfect creation is a revelation of the perfect and symmetrical spirit nature of God the Supreme before the beginnings of the power-personality synthesis of the finite reflections of the Paradise Deities in the experiential universes of time and space. 14:6.24 In Havona the power potentials of the Almighty are unified with the spiritual nature of the Supreme. This central creation is an exemplification of the future-eternal unity of the Supreme. 14:6.25 Havona is a perfect pattern of the universality potential of the Supreme. This universe is a finished portrayal of the future perfection of the Supreme and is suggestive of the potential of the Ultimate. 14:6.26 Havona exhibits finality of spirit values existing as living will creatures of supreme and perfect self- control; mind existing as ultimately equivalent to spirit; reality and unity of intelligence with an unlimited potential. 14:6.27 5. The Co-ordinate Creator Sons. Havona is the educational training ground where the Paradise Michaels are prepared for their subsequent adventures in universe creation. This divine and perfect creation is a pattern for every Creator Son. He strives to make his own universe eventually attain to these Paradise-Havona levels of perfection. 14:6.28 A Creator Son uses the creatures of Havona as personality-pattern possibilities for his own mortal children and spirit beings. The Michael and other Paradise Sons view Paradise and Havona as the divine destiny of the children of time. 14:6.29 The Creator Sons know that the central creation is the real source of that indispensable universe overcontrol which stabilizes and unifies their local universes. They know that the personal presence of the ever-present influence of the Supreme and of the Ultimate is in Havona. 14:6.30 Havona and Paradise are the source of a Michael Son's creative power. Here dwell the beings who co-operate with him in universe creation. From Paradise come the Universe Mother Spirits, the cocreators of local universes. 14:6.31 The Paradise Sons regard the central creation as the home of their divine parents—their home. It is the place they enjoy returning to ever and anon. 14:6.32 6. The Co-ordinate Ministering Daughters. The Universe Mother Spirits, cocreators of the local universes, secure their prepersonal training on the worlds of Havona in close association with the Spirits of the Circuits. In the central universe the Spirit Daughters of the local universes were duly trained in the methods of co-operation with the Sons of Paradise, all the while subject to the will of the Father. 14:6.33 On the worlds of Havona the Spirit and the Daughters of the Spirit find the mind patterns for all their groups of spiritual and material intelligences, and this central universe is the sometime destiny of those creatures which a Universe Mother Spirit jointly sponsors with an associated Creator Son. 14:6.34 The Universe Mother Creator remembers Paradise and Havona as the place of her origin and the home of the Infinite Mother Spirit, the abode of the personality presence of the Infinite Mind. 14:6.35 From this central universe also came the bestowal of the personal prerogatives of creatorship which a Universe Divine Minister employs as complemental to a Creator Son in the work of creating living will creatures. 14:6.36 And lastly, since these Daughter Spirits of the Infinite Mother Spirit will not likely ever return to their Paradise home, they derive great satisfaction from the universal reflectivity phenomenon associated with the Supreme Being in Havona and personalized in Majeston on Paradise. 14:6.37 7. The Evolutionary Mortals of the Ascending Career. Havona is the home of the pattern personality of every mortal type and the home of all superhuman personalities of mortal association who are not native to the creations of time. 14:6.38 These worlds provide the stimulus of all human impulses towards the attainment of true spirit values on the highest conceivable reality levels. Havona is the pre-Paradise training goal of every ascending mortal. Here mortals attain pre-Paradise Deity—the Supreme Being. Havona stands before every will creature as the portal to Paradise and God attainment. 14:6.39 Paradise is the home, and Havona the workshop and playground, of the finaliters. And every God-knowing mortal craves to be a finaliter. 14:6.40 The central universe is not only man's established destiny, but it is also the starting place of the eternal career of the finaliters as they shall sometime be started out on the undisclosed and universal adventure in the experience of exploring the infinity of the Universal Father. 14:6.41 Havona will unquestionably continue to function with absonite significance even in future universe ages which may witness space pilgrims attempting to find God on superfinite levels. Havona has capacity to serve as a training universe for absonite beings. It will probably be the finishing school when the seven superuniverses are functioning as the intermediate school for the graduates of the primary schools of outer space. And we incline to the opinion that the potentials of eternal Havona are really unlimited, that the central universe has eternal capacity to serve as an experiential training universe for all past, present, or future types of created beings.